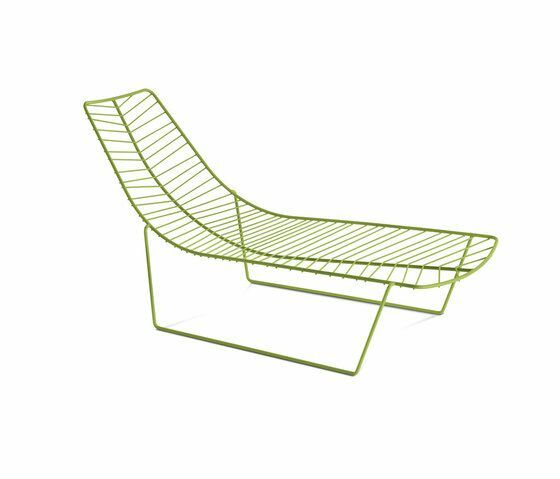 Chaise longue made of lacquered steel rod, with sled base. Available in three colours: white, green and moka. Inspired by the light yet resistant structure of leaves, Leaf is a complete seating system conceived to add a personal touch and distinctive feel to any space. The collection was conceived from observations of nature and is produced using the most modern technologies, with a very real concern for environmental impact. The Leaf system includes chairs, stackable chairs, a chaise longue and a waiting chair. All models have a painted steel structure and are available in white, mocha or green, or with a chromed finish for the chairs. Leaf also comes with two types of cushion: in polyurethane for outdoor use and soft leather for indoors. The new Leaf table is inspired by the observation of nature, which is revealed in the shape of the top — similar to the shape of a pebble polished by the water — and in the particularity of the diverse structures displaying an irregular design reminding of the branches of a tree. As well as the chair of the same collection, it is suitable for both indoor and outdoor use, and fulfills the needs of those who favor an essential design and a light presence in the space. Perfect for relaxing at work or at home, the Leaf table is the ideal companion to the Leaf chair. Leaf is available with two heights (50 and 74 cm) and round (diameter 79 cm and 100 cm), square (79 x 79 cm) or triangular with rounded edges top. The 3 or 4 leg base is made of white, moka or green painted steel. Water-repellent through colored MDF top is available only in the grey version for all base colors.